Manjuyod is a municipality in the province of Negros Oriental, Philippines. 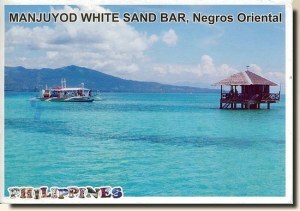 Negros Oriental is a province of the Philippines located in the Central Visayas region. It occupies the south-eastern half of the island of Negros, with Negros Occidental comprising the north-western half. It also includes Apo Island — a popular dive site for both local and foreign tourists. Negros Oriental faces Cebu to the east across the Tañon Strait and Siquijor to the south east. The primary spoken language is Cebuano, and the predominant religious denomination is Roman Catholicism. Dumaguete City is the capital, seat of government, and most populous city.